On sale May 12, 2010. 2 Comments on "Wolverine #900 Open Thread: The Eight Tales of Wolverine"
The first three tales are the only genuinely new material in the book, though we do get to see three stories that had previously been available only as Marvel Digital Exclusives, so that is a big plus. But perhaps most ironic is that one of the two true reprints in this book is the best of them all — the Wolverine/Spider-Man drinking adventure that comes the closest to being a true Wolverine classic. the first story was pretty much wolverine contemplating while killing a bunch of ninjas again..
i thought the black dragon thing could have been better. it read like a noir issue for me..
the one with morlocks was like a for all ages story. 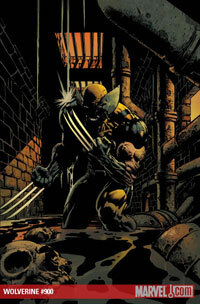 the spider-man/wolverine story was great for me..too bad i read it before reading the astonishing wolverine/spider-man #1..really very different issues..
the last one was like one of those nuff said issues from the early 2000s..but i did like the art..